Positive self-esteem is an integral part of being successful and happy. Help kids gain self-confidence, feel effective, and feel accepted with these simple activities designed to foster self-esteem. Kids who love creative mediums will take to art and writing activities. They can use them as a means to boost self-esteem by excelling at something, while others may be pushed outside their comfort zone and learn how capable they are. Kids create a praise portrait using a photo of themselves and a few words. Older children over age eight will be able to create more intricate pieces while kids as young as five can understand the basic concept. Make the portrait more memorable by pairing kids up and having each cut out words describing the other. Cut individual words out of magazines and newspapers that describe your personality, talents, and skills. Glue each word onto a relevant part of your body in the photograph by painting glue on the back of the word then over top of it once you lay it down. For example, if the word is "courage," you might glue it on your heart. Cover your entire body with words until you can only see the original background of the photo. Allow the portrait to dry completely then frame and hang if desired. Every kid has days where they feel good about themselves and days where they don't. Help develop some consistency in positive self-talk with a daily accomplishment journal. Have your child find a journal he or she loves or embellish a blank journal. Alternatively, your child can create a digital journal in a word processing app. Each night, kids ages five and up who can write on their own should jot down three to five things they achieved that day. 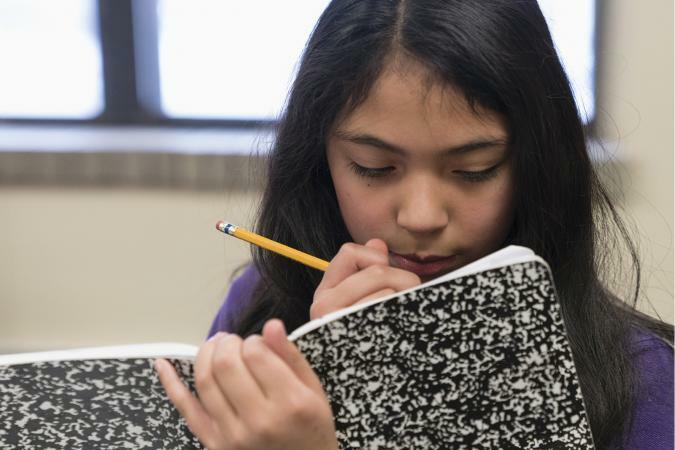 An older sibling or adult can help kids who can't write. Encourage a focus on small accomplishments in addition to big ones. For example, a child could write, "Poured cereal myself without spilling, helped four kids understand directions on a worksheet during math, or scored the game-winning basket in the game against our rival team." Although it sounds a bit pretentious, a brag book is a great way for kids to keep track of their accomplishments in life. This collection of recognition gives kids a place to be reminded of their strengths when they're feeling down about themselves. Let kids choose a medium they enjoy and task them with keeping the book current. For a modern twist, turn pictures of memorable moments into a small flip book of photo achievements using an app like chatbooks. You can easily upload photos from social media or your phone, add in dates and captions, then pay a small fee for the book. Activities and games that involve motor skills or movement engage a variety of senses and skills. Kids can try these simple projects at home, school, or a friend's house. Use them as onetime activities or build upon each mastered skill by adding difficulty to the same tasks over time. Take apart something small and insignificant like a flashlight, remote control, or a board game spinner. Challenge your child to put it back together in working order. The act of trying something new, whether kids succeed or fail at first, helps build perseverance and self-esteem. Kids who succeed quickly can feel confident they've got the skills to take on complex projects themselves. Depending on the child's personality and interests, kids as young as five can figure out how to rebuild simple, common objects. Increase the difficulty level by choosing more complex objects. This fun competition challenges kids to master a simple task using their nondominant hand. They'll see the strength they already have in completing the task with their dominant hand, then learn how they can improve their own abilities through practice. You will need a stopwatch or a timer app on a smartphone. Choose a task with a clear start and end that you can time. Younger kids can complete a household chore like setting the table and filling drinks or making a sandwich, while older kids can try writing a letter by hand, cooking dinner, or washing the dishes by hand. Ask kids to complete the task with their dominant hand while you keep time. Now have them do the same task with their nondominant hand. Encourage them to keep trying with their nondominant hand until they meet or beat their dominant hand time. When kids participate in self-esteem activities, they develop a better sense of who they are and what they can do. Try new things, practice old skills, and focus on your personal strengths to build a healthy self-image full of pride.